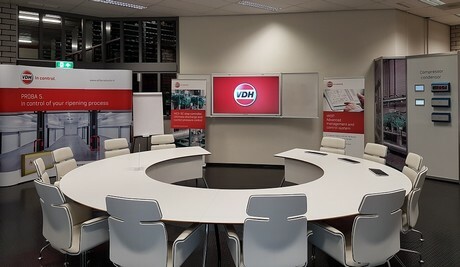 VDH Products believes that collaboration and knowledge sharing leads to better performance and goals. So as an extra service to their customers, they offer an internal course for the use of the VDH ripening system. The ripening of bananas and tropical fruit cannot be learned in theory. This happens in practice with the result that errors are copied by the successors. The experience is that users of various ripening systems often do not know the many possibilities of the ripening software like Proba. This can be at the expense of the quality of the ripened fruit, but also of the good reputation of VDH Products BV. Jointly set up protocols to improve quality (green) through targeted communication to the suppliers of the exotic species. Contact the VDH sales department.